← What’s your Opinion on What’s Appropriate? I have a lot to catch you up on. My family and I went to Honduras and I went to a writing conference where I learned Ned Stark is NOT Tony Stark’s dad. But the reason I have not been here lately is (laziness but let’s not be honest about this) due to a traumatic event in my life. 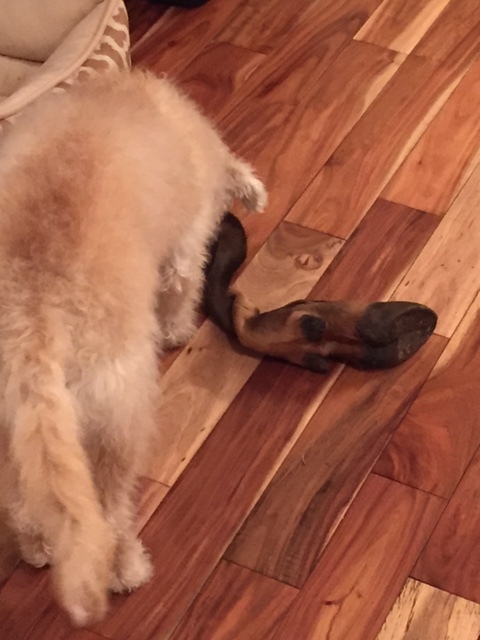 That’s an elk hoof. or foot. No longer part of the elk. And that’s my kitchen floor. I screamed. I locked myself in my room with Oreos. But the side door was open and the dog brought the elk hoof INTO MY ROOM. I called a friend’s husband to come remove it, but once he got on the phone, I felt too proud to ask him to come over to move the hoof 2 feet to the porch. I made him stay on the line as I kicked it out the door, however. And when the skin wrapped around my ankle, I screamed. But it was out of the house. I thanked Chad for being there for me and then I hung up the phone. Only for the stupid, yet fast, dog to bring it back inside the house but this time to the door of my bedroom. I quickly shut all doors leading out of my bedroom and waited until my 8 year old got home so he could take care of it. My husband posted on Facebook how dead he was and the majority suggested he buy me a pair of shoes. They were incredibly expensive shoes (for me. Not Jimmy Choo expensive. But more than Nordstrom Rack.) I was saving them for something big. But I’ve decided to listen to the people and wear them as a reward for battling an elk hoof and coming out alive. That elk has ended up being the most expensive chew toy my dog has ever had. The shoes deserve their own web page so expect to see them soon. This entry was posted in Uncategorized and tagged dogs, elk, hunting, rewards, screaming, shoes, training, trauma, writing. Bookmark the permalink.